For photovoltaics, the program automatically assigns the names PVC-1, PVC-2, PVC-3, and so on. To Bus ID name of the DC bus connected to this photovoltaic. The Base kV of this bus is shown on the right. 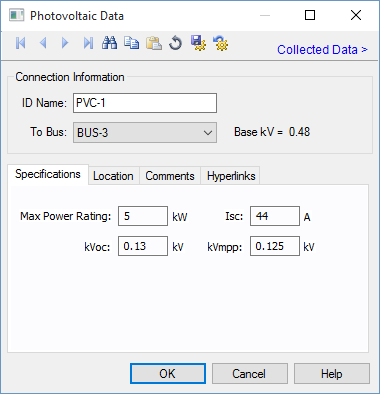 Max Power Rating Maximum power (peak power) rating of the photovoltaic in kW. Isc Short circuit current of the photovoltaic in amperes. kVoc Open circuit voltage in kV. kVmpp Voltage at which the maximum (peak) power is generated.